Created for DragonCon's 25th Anniversary and a beautiful fantasy painting in its own right. GIFT FROM THE SEA is also available in a set with DRAGON LAKE, DRAGONSBANE, FILED TEETH, WEYRWORLD, and THE WHITE DRAGON. SKU: DC-01. 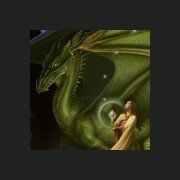 Categories: Dragons, Fantasy, Illustration, Reproduction. Tag: 2010s. Traditional offset print/poster, Hand-signed in Gold in the Image. Image: 19 1/2" x 16"